Hadassah UK brought the Hadassah Head Medical Clown; David Barashi aka “Dush” to London to provide an opportunity for UK hospitals and other community groups to see Hadassah Medical Clowning in practice and to engage in a conversation with one of the most experienced practitioner of medical clowning in Israel. Medical Clowns are “no laughing matter,” and this is an area of medicine where Israel is really ahead of the game. In the UK, Hospital Medical Clowning is not highly developed, and clowns are still used primarily as entertainment for children in hospitals. Dush came to London to show how Hadassah’s medical clowns have developed into a really serious medical tool. The big difference in the use of medical clowns in Israel results from the excellent reputation and close partnership the medical clowns have developed with the hospital medical staff. The medical personnel regard the Medical Clown as a therapist, not a performer, and the clowns are fully integrated into the work of the medical team. Medical clowns are able to develop a one-to-one, eyeball-to-eyeball, personal empathy with the patients that is different from that which parents or medical staff can achieve. They work with both children and adults in many departments. Hadassah doctors and nurses have come to develop new techniques that specifically use these specialist trained professional clowns as part of their everyday medical practices as an integral part of their “medical toolbox”. Hadassah is always looking for ways to extend the boundaries of medicine, and this also applies to the field of medical clowning. Hadassah is now training clowns to work in the Sexual Abuse Clinic, as an integral part of the Pediatric Surgical Teams, and in other adult patient departments. Dush is now an integral part of the IDF Israeli emergency team sent around the globe to natural disasters like Haiti & Nepal. He has been instrumental in developing and changing medical clowning from its inception as an experiment at Hadassah in 2002. Today, medical clowns in Israel are professionals, and are trained at an academic level up to an undergraduate degree at Haifa University. It was a real privilege to hear Dush’s presentations to hosted groups in the evenings and to accompany Dush to not only schools, where he showed himself to be a master of his art, but to Kisharon (for children and adults with severe learning disabilities) and North Middlesex Hospital and see him at work in his natural environment. 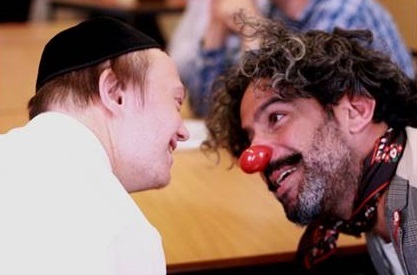 Dush’s visit to London culminated in Hadassah’s “Three Tenners and a Clown” Musical Event in partnership with the Central Synagogue. The three tenors;- Chazan Jonny Turgel, Rabbi Danny Bergson & Chazan Steven Leas together with the Shabbaton Choir and the Sacks Morasha and Immanuel College Primary School Choirs produced a magnificent evening’s music for an audience of over 300 people. The music was arranged and directed by Stephen Levy, who was ably assisted and interrupted by our very own clown Dush. It was a fantastic evening and it was lovely to have everyone leave an event having thoroughly enjoyed the music, the food and with a big smile on their faces.